Basil was the youngest son of Sir Arthur Nicholson and his death is primarily the reason we have the memorial in Leek. He was educated at the Priory School in Malvern before moving on to Rugby and then Burschied in Germany and Vevey in Switzerland to complete his education. He then joined his fathers firm as manager of the dye works at Bridge End, where he was performing well up to the outbreak of war. He had been with the Battery for several years before the war and his brother Falkner was also a Lieutenant at the start of the war (Falkner was a Major by the end of the war and post war reached the rank of Lieutenant Colonel in the Territorial Army). At the end of June the Battery were at rest at Poperinghe. They won a cricket match by 11 runs against Stoke-on-Trent’s B Battery and Basil won the Officers Jumping Competition on his horse “Simon”. Basil then left for home leave for a few days which were to be his last time in England. At 3.30pm on the 24th July 1915, Basil Lee Nicholson was the first member of the Old Leek Battery to be killed in France (dying five months after the battery reached France). He was shot in the head by a German sniper whilst trying to assess the accuracy of an artillery barrage. The Brigade diary 24th July 1915 reads “1530 Lieut B. Nicholson FOO [Forward Observation Officer] killed by sniper”. “Basil made it clear he intended to retaliate for his brothers misfortune [Falkner was wounded in the shoulder by shrapnel four days earlier in the grounds of the White Chateau at Ypres, Billy Earls the Officers Cook was playing a piano “salvaged” from the destroyed Chateau in the grounds at the time!]. 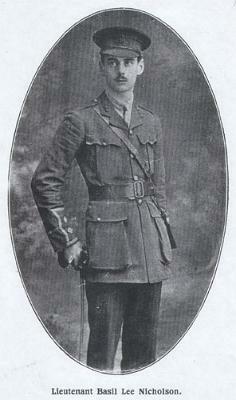 Along with Frank Bowcock the signaler, they made their way to the front line trench and the observation post. Basil relayed the order for the four guns to fire a simultaneous salvo. He then looked out from the OP, when unknown to the unfortunate Basil, a German sniper was waiting for just such a moment. It was all over in seconds, the sniper fired one round, and shot Basil in the head, killing him instantly”. He was buried with full military honours in Dranoutre, the officers of the battery and some of the men being present, including his injured brother Falkner. Major Challinor wrote of Basil, “Isn’t it sad that our first casualty should have been Basil. I hardly like to think of him and of the intimate talks and episodes we have had together. We laid the poor boy to rest in the churchyard in the village of Dranoutre. However this is war and it may be the same for any one of us at any moment, otherwise we are very fit except Falkner who is at a rest home some miles from here. I cannot write anymore as our Battery requires much attention, in the circumstances, although we have other officers sent temorarily to help”. Sir Arthur and Lady Nicholson received a telegram from the King and Queen when they heard of Basil’s death in 1915 – “The King and Queen are grieved to hear of the death of your son and offer their heartfelt sympathy in your loss. Their Majesties remember with so much pleasure their visit to Highfield”. At the time of his death he had already qualified to be a Captain and serve (probably more safely) elsewhere, but he had decided to remain a Lieutenant with his comrades in C Battery for the time being.